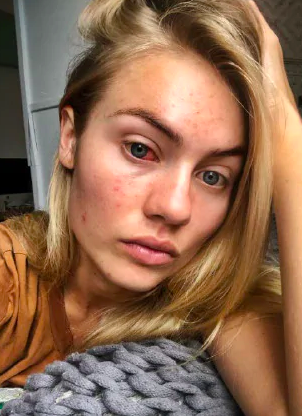 Days after model Elyse Knowles shared confronting images of her painful eye surgery, the Myer ambassador took to her Instagram account again, this time revealing details about her ongoing skin battle. The 26-year-old posted a series of barefaced images to her page. While she admitted she never usually shows a complete, makeup-free face, she wanted to share a very raw version of herself. “Why? Because women need to stick together in good times and crappy times,” Knowles said in her blog. She said that she understands some people have much bigger problems with the condition of their skin and while breakouts are not the end of the world, it still causes her to feel unhappy and down. Knowles, who is currently recovering from eye surgery where a growth was removed from her right eye, reminded her readers to never feel alone. Knowles, who shot to fame after winning the 2017 season of reality TV show The Block, went on to say that she thought she had it under control last year, but the improvements were not permanent. She went through two rounds of Roaccutane, which she is highly against, saying unless it’s a last resort that has been prescribed by your doctor don’t take it, as for her, it came with a lot of side effects. After the first round, her skin was clear for six months, but the problems returned. She hesitantly did another round and was on it during filming for The Block. “Filming the show made me even more tired! Between Thursday and Sundays, we’d be lucky to get four hours (sleep) some weeks — so with the Roaccutane on top of that, I was struggling,” Knowles said. “I didn’t tell anyone about the medication though because I didn’t want people to feel sorry for me. Since finishing the second round (about a year ago), again, she thought her skin was clear for good. Now, she is at a loss for what to do next.“I’ve tried a million products; I do regular peels and facials. I invest a lot of time (every day) and dollars to my skin and I still have not conquered the cure,” she went on to say. Knowles said that at the age of 26, she assumed her skin would finally clear up, but it hasn’t been the case. As she is constantly surrounded by makeup artists in her line of work, she said she can’t control the types of products they use on her skin. “At home and in my personal life, I am so selective. And I try to go makeup-free as much as possible. The former Seafolly ambassador reminded her readers, that in a world of social media, to ignore any nasty comments that can bring you down. “I need to ensure my skin is clear and healthy to remain professional for my clients — who deserve the highest standard. And then of course, there is social media … And we all know how judgmental the world can be when they’re hiding behind their phones … Hugely judgmental and very cruel. She summed up her lengthy blog post by saying that she again understands her skin battles are not as dire compared to others, but wanted to share her personal struggle. “This blog is not about venting, complaining or whingeing — it’s about being honest. Every single women (and person in general), battles with imperfections and things that make them feel self-conscious. We’re all in this life together — as equals,” she said. She called out to her readers, asking if any have ideas or recommendations, to let her know.